My thoughts: wow! Just wow! And I thought I loved Sarah J. Maas to my fullest capacity already and then I read this gem! I already knew the writing style would be on point. I had just finished her ACOTAR Series when I started this book so I was familiar with her style and aesthetic. I have no complaints there whatsoever. It’s why she is one of my favorite authors. I really enjoyed the plot. It was definetly a plot driven read and I found the different contests and challenges all leading up to the final duel really broke up the book nicely. Although (and this is one of the reasons I gave it 4 stars) the in between times during the challenges could be a little slow. I felt I had to keep pushing myself to-read through those parts to get to the more action packed scenes. However, she fully made up for it by not detailing out every single challenge. Sometimes the action was happening elsewhere and she just mentioned “oh hey btw there was another challenge that happened and Celeana is fine and so and so went home” so I did like that she didn’t describe every. Single. Challenge. Out in detail. The character of Celeana was superb! She is so badass and powerful that you constantly have to keep reminding yourself that she’s only 18 when this is all taking place! 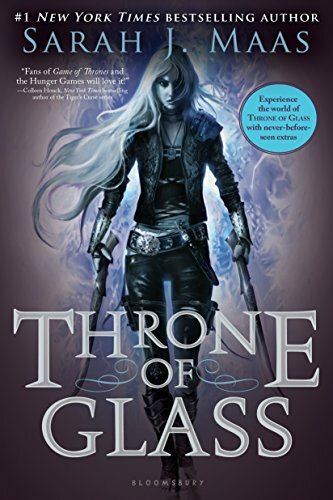 But her life has been incredibly difficult and has shaped her into the person she is when Throne of Glass begins. I have not read the prequel to this series yet, but I am anxious to read more about her backstory and see that transformation for myself. She’s incredibly witty and funny too! I just really enjoyed her as a strong, female lead in a young adult novel. Chaol and Dorian are also great characters and I love both if their own types of devotion to Celeana. I have a soft spot for Chaol and I am anxious to see how their relationship continues to develop in Crown of Midnight. I highly HIGHLY enjoyed this book. It is a long series and they are long books but they are well worth the time and energy to read them. If you are looking for an epic high fantasy read to get lost in this winter, then look no further.